When it came to planning the spec for this project, our first call was to Steffan at Polecam to see if one of their rigs would be suitable for a venue of this size. Steffan’s response; of course! Not only did he provide a Polecam and operator (Stuart Nicholls from Emagine productions), he also pushed his new product, the Autopod, our way. The Autopod is an ‘elevation unit’, which Steffan recommended for use on stage behind the drummer. 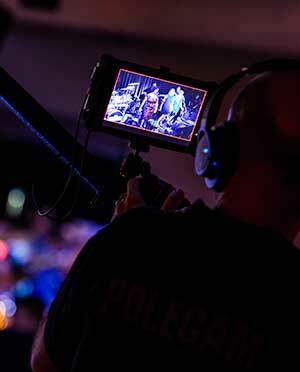 Obviously, one issue with having a camera on a cramped stage is that there is no room for an operator. Steffan (who seems to know just about everyone), passed us the contact details of Dean Offord at Panasonic, who on hearing about the project, offered to provide some PTZs for use as the cameras, eliminating the need for camera operators. Some PTZs quickly became some PTZs, the new Panasonic 4K POVCAM for the Polecam Rig, a control joystick, monitors and an operator for it all. Jump forward a few weeks, and after numerous conference calls, we arrived at the venue and started rigging. Panasonics PoE+ (Power over Ethernet) system, meant only two cables going to each camera position, making the setup easy, quick and simple. Panasonics’ PTZ cameras feature custom pre-set positions which can be recalled easily from the control panel. This allowed the mix to come across smoothly, as a pose to long repositioning times, a quick cutaway would allow the camera to reposition completely, cutting back to a brand new angle. The addition of the Polecam/ Autopod were undoubtedly the star of the show however. These systems gave a fourth dimension to the footage, and took the production value to another level. In fact, Polecam are working with Panasonic to integrate the Autopod control into the Panasonic PTZ desks.